Jeremy Clarkson has been criticised for claiming he drove at 186mph on a public road, by a father whose son died when a speeding car crashed into his vehicle. The BBC's Top Gear presenter, from Oxfordshire, told a festival audience in Wales he reached the speed while driving a Bugatti Veyron in London. He said: "The speed limit's annoying for people who have a job to do." Steve Mohabir of Godalming, Surrey, who survived a crash which killed eight people, called the remark a disgrace. 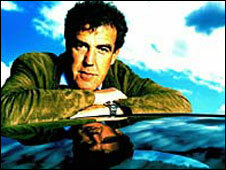 When asked about driving the supercar, Clarkson, who lives in Chipping Norton, said: "I got a great speeding ticket. I think it was 186 in the Limehouse Link. "Well, somebody did. Obviously it might not have been me." He later said the fastest he had ever driven on a public road was 186mph. Mr Mohabir's two-year-old son Marcus and close friends Kate and Toby Beasley were among those killed when a speeding BMW smashed into their Land Rover Freelander near Brighton in 2004. The five occupants of the BMW, who were all aged between 17 and 20, died in the crash. Mr Mohabir said: "It's a real disgrace that somebody with such a public appearance cannot do something to make the roads safer for other people. "It is a case of bragging and boasting and it is just like something a boy racer would do." A spokeswoman for Clarkson's management company declined to comment. A BBC spokeswoman added Clarkson had "not made the remark in response to a direct question".